With so many home styles and new home builds hitting the Cheyenne area, it’s good to know the key features and highlights of a patio home, townhouse, and condo. If you’re looking to buy a new home in Cheyenne, you may have noticed what a great town it is. From the restaurants to the stunning outdoor beauty of its mountain ranges, Cheyenne has something for everyone. As you begin your new home search, do you know what kind of home you need, or even what kind of home it is? Is it a ranch? Split level? Patio home? At Homes By Guardian, we offer a variety of homes in the Cheyenne community — from The Pointe to Thomas Heights. Take a moment today, and join us as we look at the features of patio homes, condos, and townhouses. A patio home is a home that has a broad and expansive porch, right? Actually, a patio home really has nothing to do with the patio, but more of what it’s attached to — other patio homes. The size of a patio home is often smaller but it architecturally similar to a townhouse or condo. While condos and townhouses are typically two stories, patio homes more traditionally will have one or one-and-a-half stories. Patio homes span generations and are popular among both the young and senior populations. Also known as garden homes, cluster homes, courtyard homes, and carriage homes, these homes are often more affordable pricing for entry-level home buyers and popular because of their low-maintenance living. A townhouse is a single-family dwelling with a connected wall that is shared with a neighbor and is generally two floors. They can look similar to row houses, which by nature are all in a row, but can also be configured differently setting them apart. Townhomes are often seen in large cities where space and property are a premium, but at the end of the day you own it completely. Like patio homes, townhomes offer the both of best worlds — it is more affordable than a traditional home and coveted for its virtually maintenance-free lifestyle that is often taken on by an HOA. Unlike patio homes and townhouses, you don’t entirely own the property, you essentially own what’s within your walls. A condo has been described as an apartment you own or a house without outdoor space. Officially, a condo (condominium) is a dwelling owned by a person or family in a community of other condos. The perks of condo living is there is often gyms and community rooms that offer different amenities. And while you’re responsible for what’s within your condo, any issues outside of it are often taken care of by the building management team. 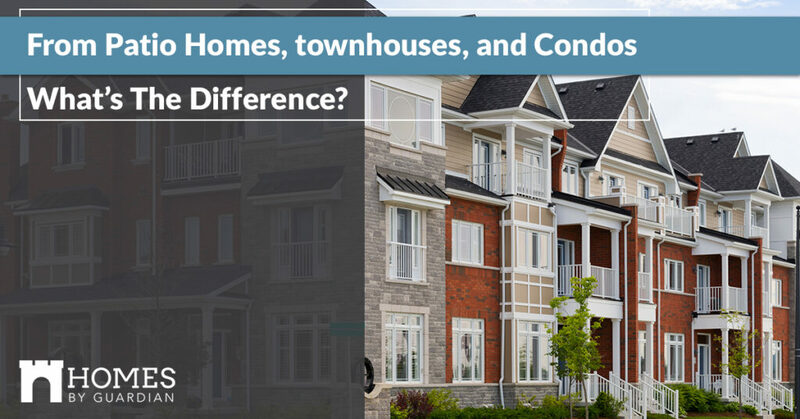 When it comes to patio homes, townhouses, and condos, it can be confusing and hard to keep them straight — technically all attached homes are the same in the eyes of the Census Bureau! They all vary slightly and offer different benefits to the homebuyer. For more information about the townhome Terraces at The Pointe, reach out to us today!